place in the central city. Indianapolis holds its own when it comes to charming vintage neighborhoods. finds its future is rooted in the past. Outstanding early Gustav Stickley forms are showcased in a New Jersey family home. 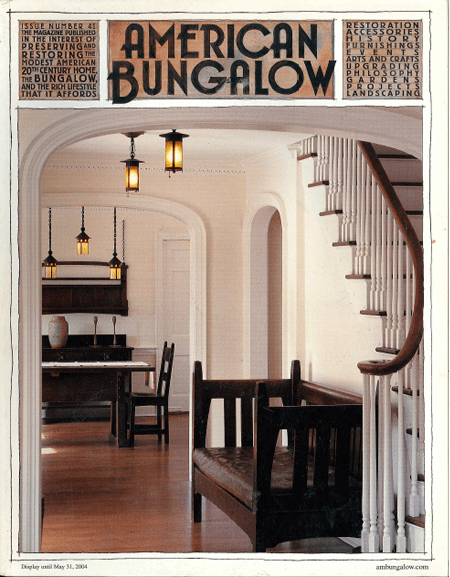 Solving settling and ’60s remuddling challenges in a Chicago brick bungalow. Three homes in Pasadena’s Bungalow Heaven reveal their stories. Vinyl siding, a decaying back porch and a water-damaged bath are no match for this creative couple. Readers share their tips, discoveries and queries. Inside and outside some of our favorite home photo submissions. Mitch Witkowski’s thoughtful approach to architectural design. by Diane Maddex and Alexander Vertikoff. Skunks and Rat Snakes and Possums, Oh My! Wild critters find this home just right.